Vladimir lives in a small town in Russia where it’s winter most of the time. It is the 1930s and he is a small boy who wakes up one day and has hiccups that won’t go away. After many sleepless nights (because of the hiccups) his mother brings him to a hospital in Moscow to be cured by the best doctor in the city. Thus taken from his home and mother, Vladimir is the recipient of many life experiences where eventually he comes to terms with his curse. This is a wild and strangely exciting book about a boy named Vladimir who develops a serious case of the hiccups. Vladimir’s hiccups are so extreme that they keep him up at night. After three straight days, his impoverished mother brings him into Moscow to be cured by the best doctors in the Soviet Union. The next few years for Vladimir are ones of medical intervention and trauma. This included a nightly routine of morphine to help him fall asleep at night. Through a strange rivalry between two doctors in the hospital, Vladimir is eventually ousted from Moscow and spends the rest of his childhood in an Mongolian Buddhist temple. His hiccups remain with him until he travels back home, first to Moscow and then to see his mother. The story ends with the good Vladimir sacrificing himself for the betterment of someone he loves, and dies a gruesome death while coming to terms with his hiccups. Meades creates a bizarre and satirical world for Vladimir. The back cover of this novel calls The Last Hiccup a HumCanLit (a genre in which I’d been ignorant of all these years!). It is a strange tale, but not so strange as to be fantastical. The character of Vladimir lacked a bit of depth, but the premise was compelling enough that Meades pulled it off. I don’t enjoy a lot of satirical novels, but this one I finished right to the very end! I’m still struggling to piece my thoughts together on this one. I think the point of the book (and of the hiccups) is that as humans we struggle with the need to be recognized and appreciated. Vlady developed hiccups just at a time when he was developing a sense of self-hood. When a person’s place in the world is tentative, such as during adolescence, the desire for significance becomes important. Vladimir, in order to survive must come to term with his curse and learn to rely on his hiccups as a touchstone of who he is and ultimately how he will be defined. 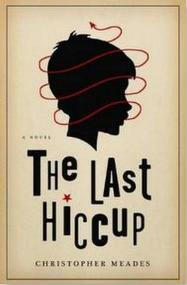 And so, I recommend The Last Hiccup wholeheartedly. Unless of course, you dislike allegory. Some of the facts were a bit under-developed and puzzling, but for the most part I found the book intriguing and humorous. Thanks for the review! So glad you enjoyed it !! !